As required by law, unless a valid and properly completed SALES TAX EXEMPTION DOCUMENT has been received by us from your business or organization, Restaurant Equippers, Inc. must collect and remit sales tax for all merchandise picked up by you or delivered to you within the following states: Alabama, California, Colorado, Connecticut, Georgia, Illinois, Indiana, Iowa, Kentucky, Maine, Maryland, Massachusetts, Michigan, Minnesota, Mississippi, Nebraska, New Jersey, New York, North Carolina, Ohio, Oklahoma, Pennsylvania, South Carolina, South Dakota, Vermont, Washington, West Virginia, Wisconsin and Wyoming. If your business or organization has tax-exempt status in any of those states where you are to pick up or have merchandise delivered, in order for Restaurant Equippers to make your purchase non-taxable you must fax to us a properly completed Sales Tax Exemption Document. 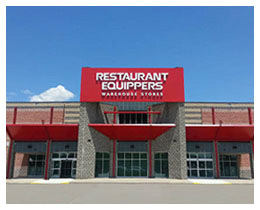 To assist you we have included for each state those Sales Tax Exemption Documents most commonly utilized to help document our customers Tax Exemption Status here at Restaurant Equippers. Click on the appropriate state where you will be picking up or having the merchandise delivered. Choose the exemption document that represents your reason for exemption in that state. Complete the document (and attach any additional information that may be required). Fax the properly completed Exemption Document (along with any additional information that is required) toll free to our tax department at (855) 312-2676. Contact our Tax Department toll free at (800) 235-3325, Extension 118 or 147 to confirm receipt. Once the completed certificate has been received and validated, Restaurant Equippers will mark your account as tax exempt for delivery within that state. Restaurant Equippers, Inc. does not currently collect and remit sales tax on deliveries to states other than those listed. However, in some cases an order may be shipped directly from the manufacturer to you in a state where the manufacturer has a taxable presence (nexus). In such cases, Restaurant Equippers, Inc. may be required to collect and pay the applicable tax to the manufacturer prior to shipment. We will alert you in these instances before collecting additional funds. Should your exempt status be a result of being a non-profit exempt organization or an exempt federal, state or local government organization, in addition to providing us with your initial exemption document in some cases we will need additional documentation for each transaction that will verify that your payment for such transaction is being made directly from your exempt organization's funds as required by that state’s sales tax law (i.e. in some states a copy of the payment document or the credit card showing the name of your exempt organization is required for each transaction). In such cases, payment by cash, personal check or personal credit card cannot be accepted even if it later reimbursed by your organization. In the event that you are a tax exempt business or organization and have paid tax in error, please contact us at (800) 235-3325 to provide the required exemption information and obtain credit for the taxes charged. Such refunds can normally be made only within 30 days after the sale was completed. Otherwise, special procedures may be required to obtain refund from the state. Note: If you are an existing Restaurant Equippers customer and already have exempt status with us by visiting our stores or phoning in an order, the first time you place an online order our website will not recognize your exempt status. As a result, when placing your first order on our website, type "Tax Exempt" in the Comments box of your web order during Checkout. This will alert us to update your online account with your exemption status so that your current order and all future website orders will reflect your exemption.